Bohemian Wrist Tangles Become Known As ‘Kanye Bracelets’. But while the man is known for music and moods, don’t rule out his bracelets. Since appearing at the Coachella music festival last spring with a wrist full of bracelets from Cartier and Burkman Bros., Mr. West has not only given his endorsement to a trend on the rise, but he has, whether he likes it or not, also given it his name. 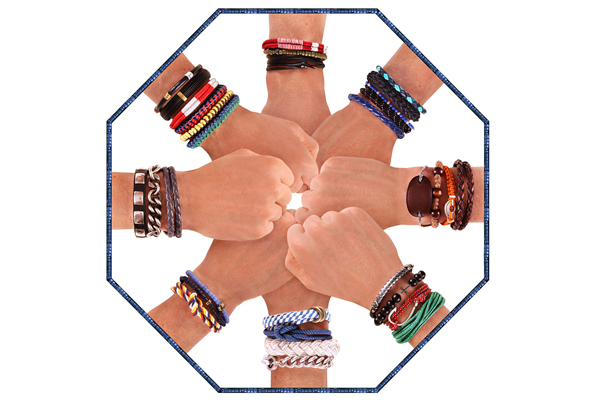 Almost immediately, fashion and music blogs started referring to any and all bohemian wrist-tangles as “Kanye bracelets.” Burkman Bros. was so besieged by demand for its bracelets that the company introduced an e-commerce site to handle it, said Doug Burkman, one of the two brothers who are the owners. They have now sold more than 50,000. As of Wednesday, 790 auctions for bracelets on eBay made reference to the stylish rapper and producer. But the vogue for wrists roped in beads and twine is not driven just by Kanye followers. Courtesy of accessories companies like Miansai, Luis Morais, Tateossian and Kiel James Patrick, there was already a significant under-the-radar movement of guys, even conservative ones, gravitating toward them. To restate the obvious, the look is not about one perfect bracelet. What guys are after is a mix of colors, textures and materials, with a good, classic watch thrown in for good measure. You may want to max out at four or five lest you look more like Madonna ’84 than Kanye ’11. Especially since, unlike most accessories a man can wear, the Kanye bracelet often packs a bit of a punch, bringing a lot of color and personality to a relatively small piece of real estate. But then, a little jolt of transgression is exactly the point. In other words, think of them as handcuffs that can set you free. A version of this article appeared in print on February 23, 2012, on page E11 of the New York edition with the headline: Brothers at the Wrist.